Discussion in 'The Lounge' started by Jake from State Farm, Sep 10, 2018. Athletic Evaluation: Amazing quickness and speed—will set records as a returner. But that's it. Gump doesn't seem to understand any of the rules of football. He needs the ball caught for him and handed to him during returns, and he may not even know what an end zone is. But boy is he fast. 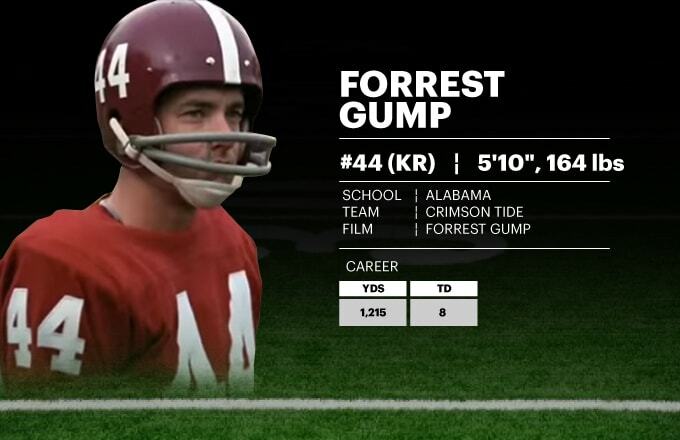 PC Evaluation: Obviously Forrest was meant for bigger things after college, but let's say he decided to go pro after graduating from Alabama instead of enlisting in the army. The future would change in two ways—Devin Hester and Deion Sanders would not hold the NFL record for most return touchdowns, and Lieutenant Dan would have died in Vietnam, and would therefore never have been able to turn into that greasy alcoholic double amputee who abuses prostitutes and haunts my childhood dreams.